Much of the information we have on Edward is from a few pages of hand written notes, penned by his niece Betty Stanaway (Thomas Stanaway’s daughter) in 1996 and 1997, it was to be kept with the Stanaway Family archives. – Thanks to Colleen Stanaway for sharing this information. Edward Percy Stanaway (Ted) was born on 25 October 1899 (Birth Certificate 1902/14412) in Mangapai, in the Northern Wairoa. He was the 4th child of James John and Ellen Stanaway. Not much is known about Ted’s childhood but would could expect that it was much the same as his siblings and other children at that time. He had the family fondness for horses, and as a young teenager became an apprentice jockey at Ellerslie. At first he rode under the name Edward Stanaway, until one day, early in his career, the board with the jockey’s names in Ellerslie made a mistake and wrote Ted Stanway. He liked it and kept it, using it in all his future dealings – he liked things to be “short and snappy”. Ted loved to travel, and often took horses to Sydney by sea and undertook riding engagements while there. Much of his life was spent in Australia, where there were bigger opportunities for riders. He had a very piercing whistle which could be heard a great distance, also a colourful vocabulary of swear words, used when necessary to a recalcitrant horse, such as the well-known Archibald. The horse Archibald, was supposed to be the most ugly and ungainly horse ever to set hoof on a race course. He liked to bite the legs of his riders, but could go like a rocket when in a good mood. This horse was very large and of an uncertain temperament but he and Ted were a great combination, and had a number of wins, all over the country. 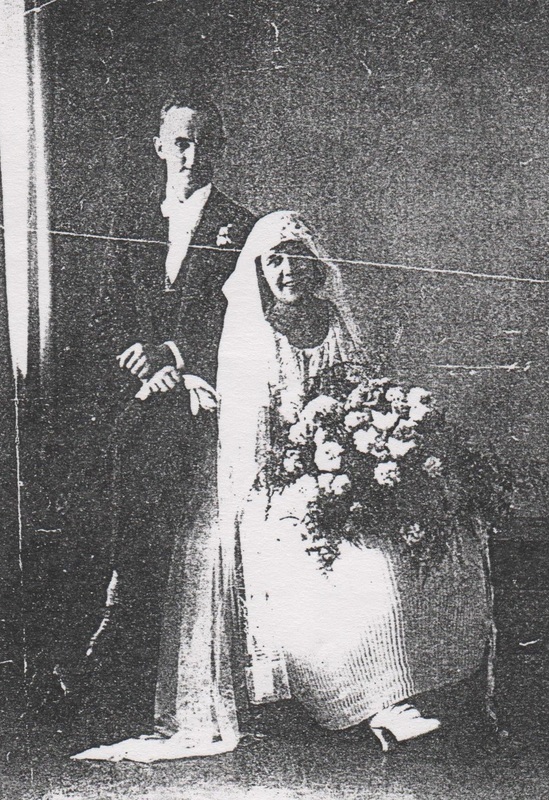 By 1924, Ted had married Dorothy (Doris) Lavinia Hunt (Marriage Certificate number 1924/2695). Dorothy was born 14 August 1905. She was the daughter of Mr & Mrs C.R. Hunt of Greenlane. On 19 August 1926, Patricia Marie is born – Ted and Doris only have the one child. 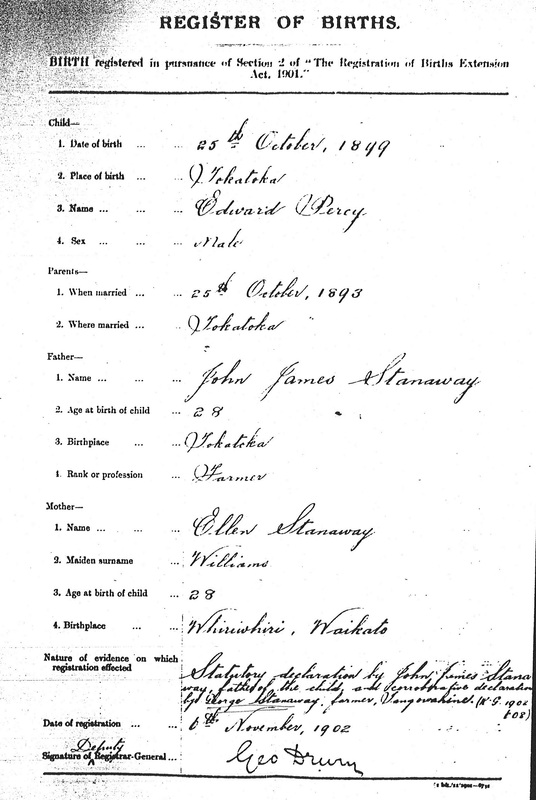 Edward’s birth Certificate – Colleen Stanaway Collection. NZT 31 October 1925 – Ted Stanway was taken away to hospital for treatment after Kendal unseated him at Te Rapa. It was thought his ribs and shoulder were damaged, but he looked cheerful, and it may not be serious. NZT 01 April 1926 – Ted Stanway’s mounts at Ellerslie will include Archibald in the Brighton and Bahudur in the Mangere Steeples. NZT 08 April 1926 – Stanway’s Horsemanship – Ted Stanway is a hurdle horseman who had to fight his way to the top. His was no easy task to secure favorable mounts when he first took to hurdle riding, but by sheer perseverance he has reached the stage when he is recognized up north as a very capable rider – one who is game enough to give it a go at all times, but yet can use some judgment when required. He was certainly on the goods when he steered Archibald to victory in the Brighton Hurdles, but did the right thing when he prefered to give his mount a rest going up the rise at the old mile-post last Saturday. Once over that he soon took Archibald out of harm’s way to the front, and the rest was easy, for in his hands the son of Archiestown jumped well and ran home an easy winner. NZT 22 April 1926 – Light Fingered – During the Avondale meeting, held at Ellerslie, the sneak thief made his presence felt in the jockey’s room, when Ted Stanway lost a whip and Maurice McCarten an overcoat. NZT 03 June 1926 – Ted Stanway’s rides at Ellerslie include Archibald, Radio, Pittsworth and West Abbey. NZT 29 July 1926 – Ted Stanway has gone off to Gisborne to ride Radio and Silverfish in their engagements this week. 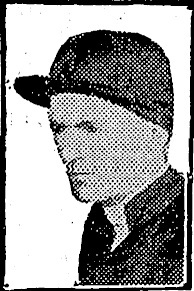 NZT 29 July 1926 – Bill Rennie is mentioned as pilot for Tuki in the Grand National Steeplechase. Ted Stanway rode him at Trentham. NZT 23 September 1926 – Ted Stanway will be on Mahgaloire in next Saturday’s hurdle event. The Brighton Hurdles victor was over at Ellerslie recently from Avondale clearing hurdles safely. NZT 07 April 1927 – This Years Ride – Ted Stanway, who rode Archibald home first in the last Brighton Hurdles, will steer Gold Rain this year. Ted has also contracted to ride Day Bell in the Mangere and Kendal in the Autumn Steeples. NZT 02 August 1928 – Ted Stanway, the ex-Auckland hurdle horseman, is still riding round about Sydney. NZT 26 April 1929 – The winning post could not be reached quickly enough by Ted Stanway on Ned Kelly first day at Whangarei. Ned Kelly is a speedy fencer when the hurdles are not too bulky, and he gave a great display out in front, with the erratic and inexperienced Golden Wedding in hot pursuit. The pair were at close quarters coming to the last obstacle, which “Ned” cleared beautifully, but Golden Wedding made a slovenly attempt. This saved the day for “Ned’s” connections, and he scrambled home by inches only. On the second day the extra poundage beat Ned Kelly into third place, while Golden Wedding duly arrived home safely because of her superior speed on the flat. NZT 08 August 1929 – NZ truth’s photographer had a laugh to himself after the Longbeach Hurdles at Riccarton last Saturday. he went out in an endeavor to get a picture of Elysianor, but when he approached the jockey, Ted Stanway, he was told to clear out. “You’ll cruel my luck if you take a picture before the race,” quoth Stanway. The photographer reckoned that such was so much rubbish, and asked the rider to get up, but Ted persisted in his theory that to be taken before a race was bad luck. So the photographer gave him up in disgust, perhaps. The race started and Elysianor and Stanway raced with the leaders down to the first fence. Elysianor took off a minute too soon, and landed on the fence, and Stanway landed on the ground. The photographer is still chuckling over the bad luck part of the story. The 1928 until the 1938 Electoral Rolls have Ted and Doris living at 7 Miro Road, Greenlane, Ted is listed as a Jockey. The Electoral Rolls from 1938 until 1954 have Dorothy living at either 218 or 374 Great South Road, Greenlane. It would appear that Ted and Dorothy had separated, but never divorced (Dorothy lists her self as “married” in all of the Electoral Rolls). The house at no.7 Miro Road, may have been Ted’s until his death when Dorothy receives his estate. At the outbreak of WWII Ted tries to enlist in the New Zealand Army but is turned down on medical grounds, so he travelled to Sydney, Australia and on 25 October 1940, Ted enlists into the Australian Army, service number NX56621. He makes the rank of Gunner and was with the 2/1 Survey regiment Artillery. He serves in the Middle East and North Africa, he is discharged on 15 August 1942, apparently suffering from sand in the lungs, this was a problem he would suffer with for the rest of his life, being in and out of Hospitals in Sydney. He was past the age to resume riding, and took an office job for the Navy at Garden Island, in Sydney. He always marched in the ANZAC Day Parade in Sydney, wearing his medals, and looking very dapper, as always. He always had a keen sense of humour, a born gentleman. In his fifties he developed motor-neuron disease, which slowly disabled him, and ultimately caused his death. Ted returned to New Zealand just before his death. Ted died on 1 December 1954 (Death Certificate number 1956/24870), aged 54 years. He was buried on 3 December 1954 in the Waikumete Cemetery, Glen Eden, Auckland, in the RSA Section, Block J, Row 2. The 1957 Electoral Roll has Dorothy now living at 7 Miro Road, Greenlane, with her brother and sister-in-law George Frederick and Eva May Stanaway. The 1963, 1969 and 1972 Electoral Rolls have Dorothy living at the same address, 7 Miro Road, Greenlane. Sacred to the memory of Dorothy Lavinia Stanaway died 29 July 1973 in her 69th year. Ever remembered by her son-in-law Beamish, daughter-in-law Coral and grandchildren Steve and Sue RIP.